A live debate between Bro. Eliseo Soriano against a Brazilian pastor will be held on September 21 this year at 1 PM (Brazilian time) in São Paulo, Brazil. There will also be live streaming on Youtube for the worldwide audience. On Philippines, Singapore, and Hongkong time, the event will already be Monday at 12 midnight. 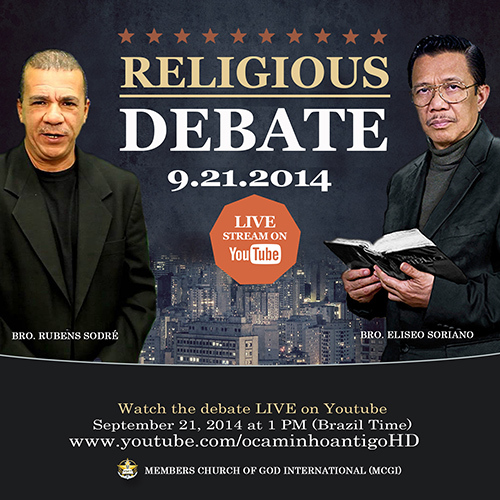 Online, O Caminho Antigo Youtube channel of the Members Church of God International (MCGI) will broadcast the debate live. Bro. Eli, the host of O Caminho Antigo in South America, is the multi-awarded televangelist host of Ang Dating Daan religious show in the Philippines. He is the Presiding Minister of MCGI. Pastor Rubens Sodré, on the other hand, describes himself on Twitter as “Sou Rubens Orador Da Serie Prepare-Se Perfil Oficial”. His website, verdaderooculta.com.br, means “Hidden Truth”. The debate came after Mr. Sodré accused Bro. Eli of deceiving people when the former attended as audience in one of the Bible Expositions hosted by the latter for the Portuguese speaking regions of South America. Both parties agreed to have the debate set on September 21. The mechanics of the friendly debate was also established during the same occasion. The International Evangelist hosts Bible Expositions in various languages for the viewers of his programs from the different parts of globe.